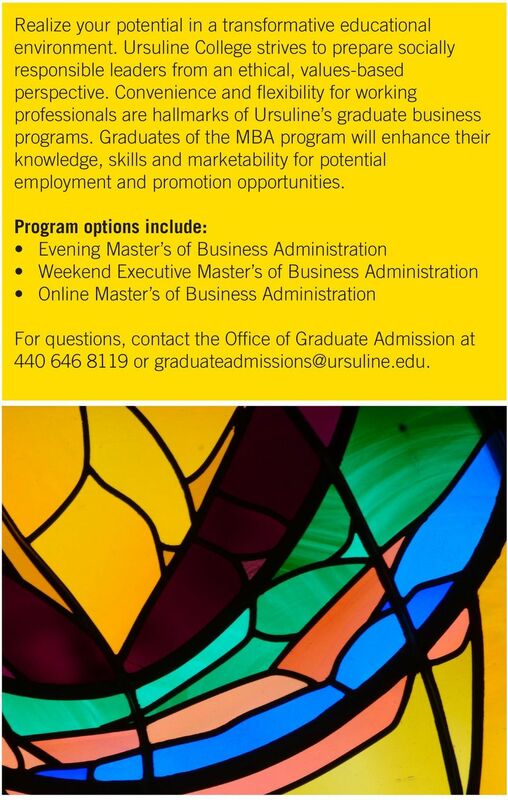 Download "Master of Business Adminstration (MBA) Evening, Executive and Online"
3 Prerequisites for Admission The Graduate Business Programs depend on each student bringing managerial experience into the classroom. At least three years of managerial experience is expected for the Evening and Online MBA; five years of managerial experience is expected for the Executive MBA. All candidates must be proficient in the use of word processing, spreadsheet software and presentation software. All students enrolled in the program must have access to a computer, including internet access throughout the duration of the program. 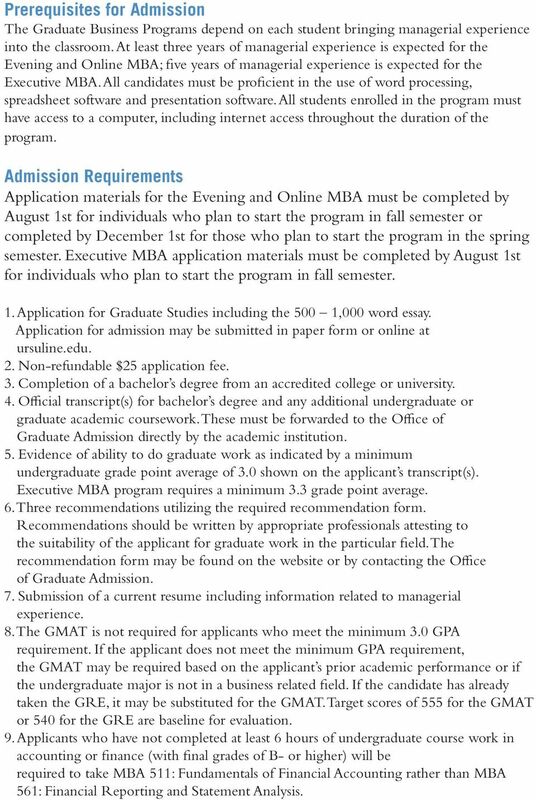 Admission Requirements Application materials for the Evening and Online MBA must be completed by August 1st for individuals who plan to start the program in fall semester or completed by December 1st for those who plan to start the program in the spring semester. Executive MBA application materials must be completed by August 1st for individuals who plan to start the program in fall semester. 1. Application for Graduate Studies including the 500 1,000 word essay. Application for admission may be submitted in paper form or online at ursuline.edu. 2. Non-refundable $25 application fee. 3. Completion of a bachelor s degree from an accredited college or university. 4. Official transcript(s) for bachelor s degree and any additional undergraduate or graduate academic coursework. These must be forwarded to the Office of Graduate Admission directly by the academic institution. 5. Evidence of ability to do graduate work as indicated by a minimum undergraduate grade point average of 3.0 shown on the applicant s transcript(s). 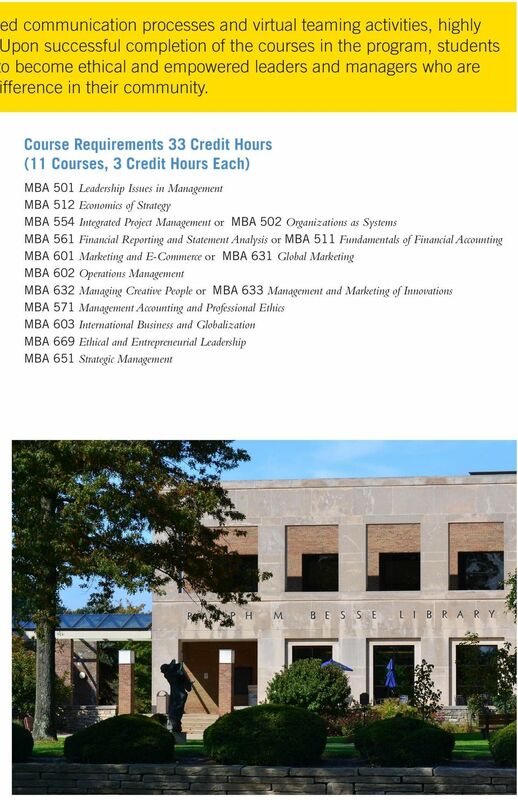 Executive MBA program requires a minimum 3.3 grade point average. 6. Three recommendations utilizing the required recommendation form. Recommendations should be written by appropriate professionals attesting to the suitability of the applicant for graduate work in the particular field. The recommendation form may be found on the website or by contacting the Office of Graduate Admission. 7. Submission of a current resume including information related to managerial experience. 8. The GMAT is not required for applicants who meet the minimum 3.0 GPA requirement. If the applicant does not meet the minimum GPA requirement, the GMAT may be required based on the applicant s prior academic performance or if the undergraduate major is not in a business related field. If the candidate has already taken the GRE, it may be substituted for the GMAT. Target scores of 555 for the GMAT or 540 for the GRE are baseline for evaluation. 9. 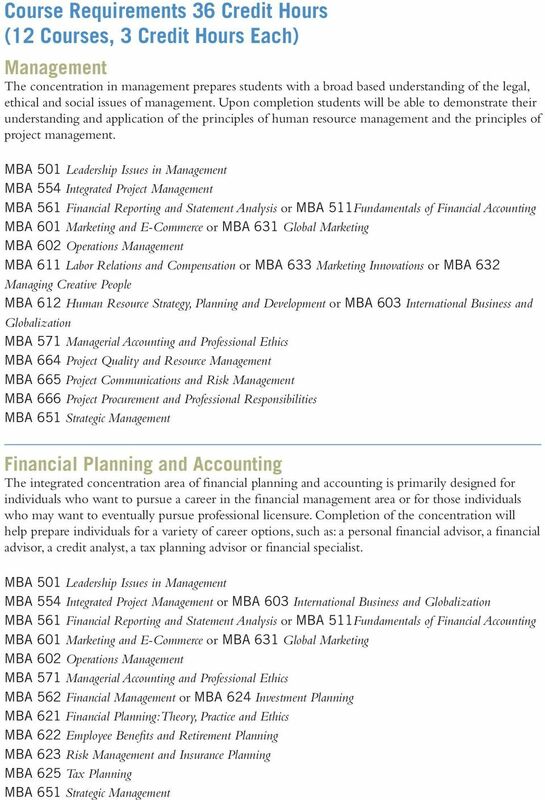 Applicants who have not completed at least 6 hours of undergraduate course work in accounting or finance (with final grades of B- or higher) will be required to take MBA 511: Fundamentals of Financial Accounting rather than MBA 561: Financial Reporting and Statement Analysis. 4 Evening MBA The Evening MBA program includes four concentration options: 1) management; 2) health services management; 3) marketing and communications management; and 4) financial planning and accounting. The most distinguishing feature of Ursuline s concentration areas is the integrated, cross-disciplinary design feature that focuses on the interrelationships across business areas. This feature provides graduates of the program with a competitive career advantage in the field of leadership and management. The Evening program courses are typically offered one night per week using an accelerated five-week course format; there are three, five week mini-terms per semester. Students may enroll in a full-time or part-time basis. Some courses are structured as hybrid or as online courses. The hybrid and online course formats introduce students to technology-enhanced communication processes and virtual teaming activities, which are highly valuable 21st century skills that all future leaders should master. 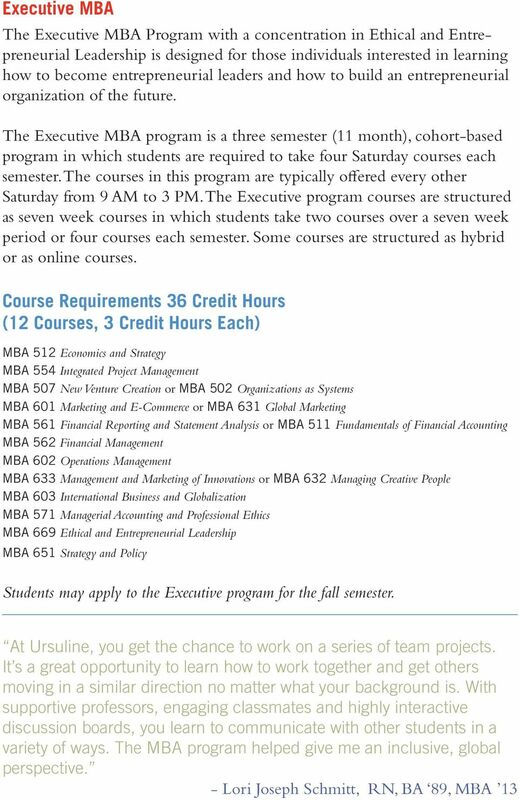 Fast Track MBA (fall semester): Students, who start the program as a new graduate-level student in the fall semester and enroll in four courses (12 credit hours) per semester, have an option to complete the program within three semesters. This option requires students to take one course at a time during the five week mini-term, with the exception of one mini-term per semester in which students take two courses. When students are required to take two courses at a time, the courses are typically structured as hybrid or online courses. Students who start the MBA program in the spring semester have the option to complete the MBA degree over fours or more semester contingent upon the number of courses completed each semester. Students may apply to the Evening program for fall or spring semester. 8 Entrepreneurial leaders are creators of fundamental and radical change and therefore must learn how to adapt quickly to solving problems and making decisions within a dynamic global environment. 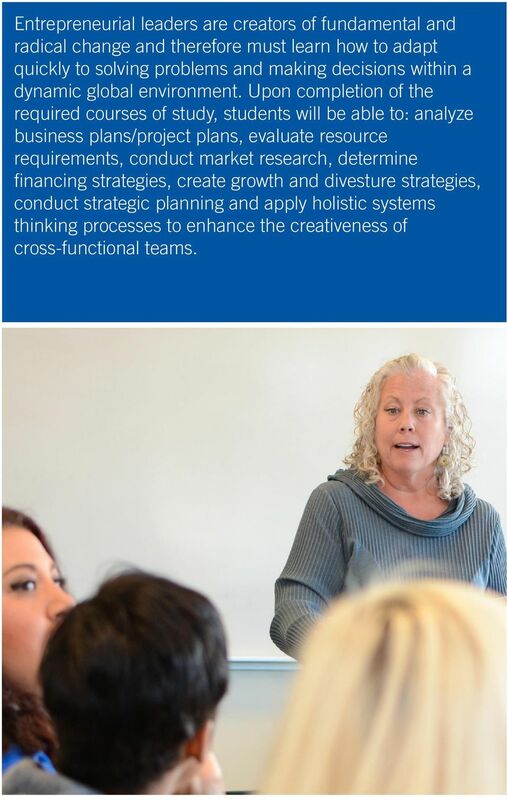 Upon completion of the required courses of study, students will be able to: analyze business plans/project plans, evaluate resource requirements, conduct market research, determine financing strategies, create growth and divesture strategies, conduct strategic planning and apply holistic systems thinking processes to enhance the creativeness of cross-functional teams. 10 The online MBA Program introduces students to technology enhanc valuable 21st century skills that all business leaders should master. 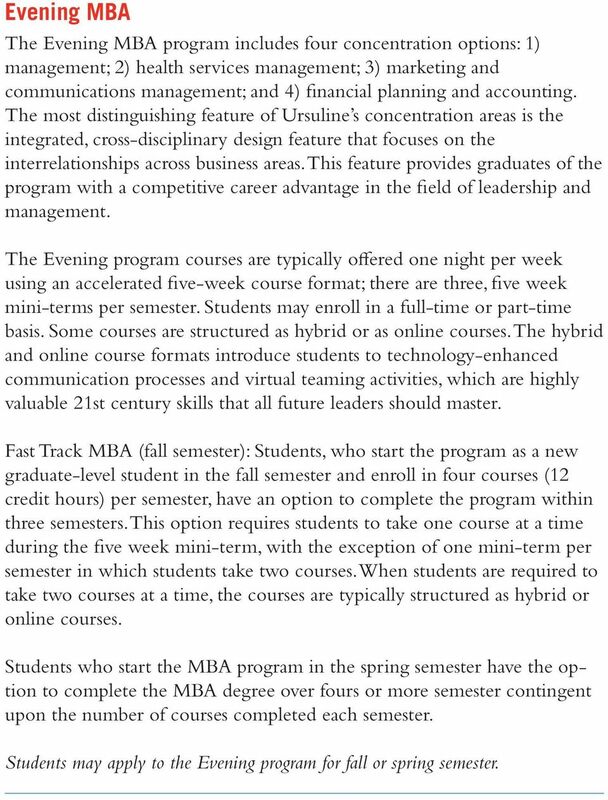 U will be able to demonstrate that they have the knowledge and skills t informed and dedicated to helping business organizations make a di Online MBA Program Ursuline College s Online MBA program is designed to meet the needs of working professionals. 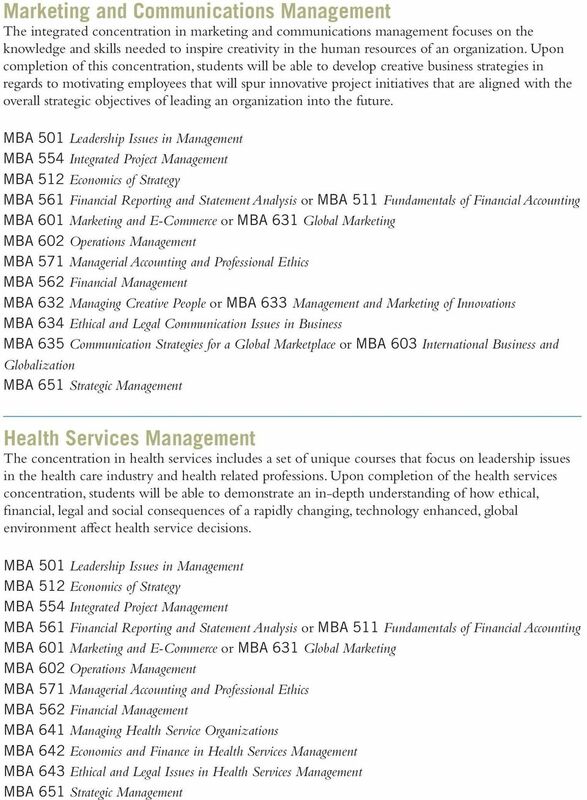 The 33 credit hour Online MBA focuses on the integration of management and leadership. The program consists of eleven required courses that are offered in the online environment. MBA course instructors come from all areas of the business and professional community, bringing not only advanced degrees in their fields, but years of experience elevant to course concepts. MBA courses are typically offered every five weeks using an accelerated approach, rather than a traditional 15 week semester approach. Students may elect to take only one course at a time every five weeks within each semester. Each semester (fall, spring and summer) is divided into three five week mini-terms. Students may enroll on a full-time or part-time basis. If students enroll on a full-time basis, taking three courses each semester (full-time status), they will complete the Online MBA program in only 15 months (four semesters). Candidates for this program must be highly motivated and be willing to complete the demanding course requirements within a fast paced environment. 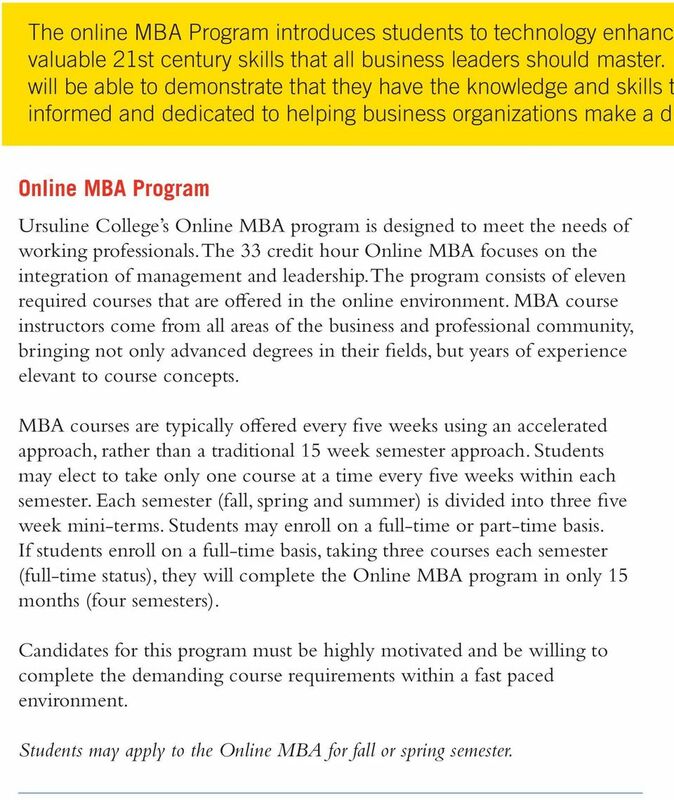 Students may apply to the Online MBA for fall or spring semester. Guide to. Offerings 2007-2008. The UB/Towson MBA. 1420 N. Charles St. Baltimore, MD 21201 410.837.6565 (Admissions) 410.837. 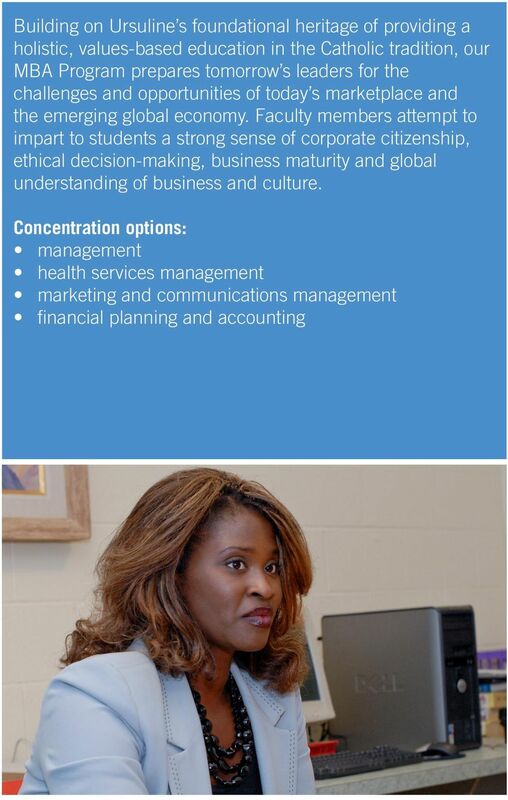 Master of Science Degree HUMAN RESOURCES MANAGEMENT. Engaging Minds. Embracing the World. 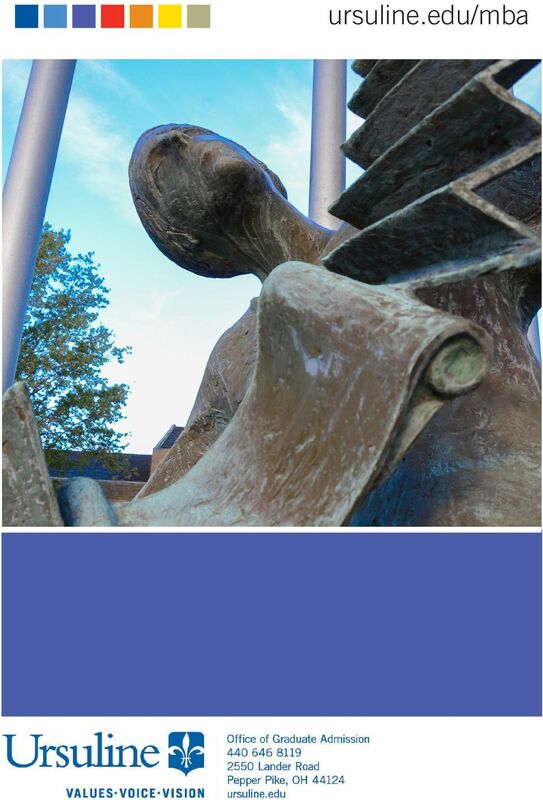 Master s Degree Frequently Asked Questions: The Program and Admissions. When is the next application deadline for Summer/Fall admissions?